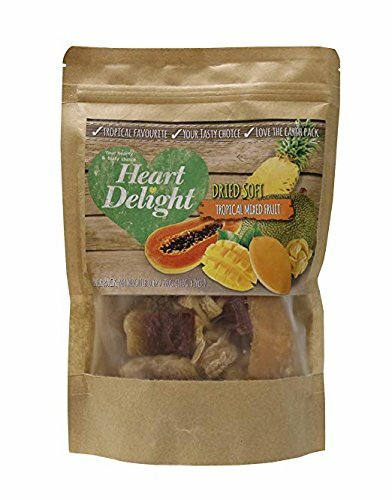 Heart Delight Dried Soft Tasty Tropical Mixed Fruit Kosher Certified 280 gr. - 9.8 oz. As fresh and colorful tropical fruits at peak quality are picked right beside the farms with our love&care, they are elaborately produced through our standard manufacture to supply you, keeping nice color, great texture and definitely great taste. Dehydrated fresh tropical fruits produced to remain the fresh of fruits serve you as healthy snack, a new choice of fruit consumption. Be safe because of no artificial flavor and color additive in our production. Be sure of our food safety and standard of our production certified and accredited with GMP, HACCP standard. Dried Fruit Salad Mix in Resealable Bag. Sweet, juicy and delicious. Always fresh taste. LOVELY SNACKS: Source of fiber. High in vitamins and minerals. If you have any questions about this product by Heart DeLight, contact us by completing and submitting the form below. If you are looking for a specif part number, please include it with your message.